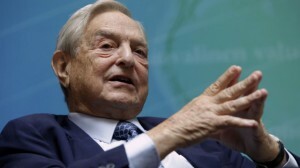 Judicial Watch recently filed Freedom of Information Act (FOIA) lawsuits against the Department of State and USAID to uncover the facts concerning allegations that George Soros' left wing groups in Colombia, Romania, Macedonia and Albania...are being supported by millions of US taxpayer dollars. Evidence uncovered to date suggests there is collusion between officials from the Obama State Department and George Soros to destabilize democratically elected governments in these four nations overseas. George Soros has the right to his political opinions. He also has the right to back his opinions with his money - but we certainly do not believe that the America taxpayer and the American government should be footing the bill! Hi-level sources in the Balkan nations of Macedonia and in the United Sates have provided records as part of this investigation indicating that Obama appointed US Ambassador to Macedonia, Jess L. Baily is involved in precisely that kid of prohibited activity. It appears Baily improperly colluded with George Soros by working behind the scenes with Soros' Open Society Foundations to funnel $5 million in American taxpayer dollars from US Aid in Macedonia to destabilize the conservative government there - constituting an interference.